If you ever wondered what are your chances of winning a bet with odds 3 to 5, our odds calculator is here to help you. Having given the betting odds, you will now be able to calculate the percentage probability of winning or losing and decide whether the reward is worth the risk. You will also find out how to calculate the odds ratio using the odds equation. The odds are usually presented as a ratio. For example, the odds of your favorite football team losing a match may be 1 to 5. The odds of you winning a lottery might by 1 to 10,000. On the other hand, the odds of the horse you bet on winning the race may be equal to 4 to 3. What do these numbers mean? There are two types of odds ratios: "odds of winning" and "odds of losing". For odds of winning, the first number are the chances for success and the second is the chances against success (of losing). For "odds of losing", the order of these number is switched. Let's analyze one of these options more closely. For example, if the odds for a football team losing are 1 to 5, it means that there are 5 changes of them winning and only 1 of them losing. That means that if they played 6 times, they would win 5 times and lose once. 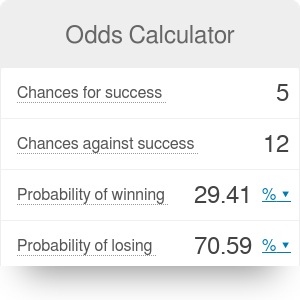 Our betting odds calculator takes a step further and calculates the percentage probability of winning and losing. The team would win 5 out of 6 games and lose 1 of them. By converting fraction to percent, we can say that the chances of winning are 5/6 = 83.33%, and of losing 1/6 = 16.67%. Find out what are the odds expressed as a ratio. Let's say that the odds of you winning in a school lottery are 5 to 12. Decide which number represents chances for success (for winning), and which against success (for losing). In this case, there are 5 chances for success and 12 chances against success. Sum all of the chances: 5 + 12 = 17. Calculate the probability of winning according to the odds formulas. 5/17 = 29.41%. Calculate the probability of losing according to the odds formulas. 12/17 = 70.59%. Check whether the result is correct with the betting odds calculator. Odds Calculator can be embedded on your website to enrich the content you wrote and make it easier for your visitors to understand your message.